November was a month of both remembrance and gratitude. Here in the United States we have Veteran’s Day and Thanksgiving, but how often have you thought about them in the same context? 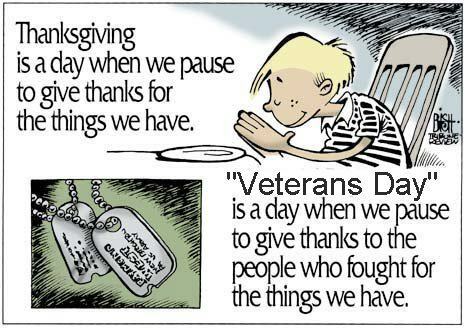 What I mean is, how often have you thought about the veterans and what they will do for/at Thanksgiving? Determine the need in your community. Visit with homeless veteran service providers. Contact your mayor’s office for a list of providers, or search the NCHV database. Involve others. If you are not already part of an organization, align yourself with a few other people who are interested in attacking this issue. Participate in local homeless coalitions. Chances are, there is one in your community. If not, this could be the time to bring people together around this critical need. Make a donation to your local homeless veteran service provider. Check for places in your area that will be offering Thanksgiving dinner for homeless vets. This is one example. Check local churches, food banks, the Salvation Army or soup kitchens who might need donations of food or money or who could use volunteers on that day (or any other day, for that matter). Offer to drive a veteran to an event. The DAV has a program to make this easy for anyone wanting to help. Simply click the link at the beginning of this sentence and see for yourself. “In times of war, exhausted combat units were removed from the battlefield to “stand down” in a place of relative security to rest. The Department of Veterans Affairs’ Stand Down program is designed to help homeless veterans “combat” life on the streets. Stand Downs are usually one- to three-day events to provide food, shelter, clothing and health screenings to homeless and unemployed veterans. To find a Stand Down program in your community, contact your local VA hospital in the VA Medical Center Directory.